Mayalasia – One Dead, Five Injured As Fire Causes Explosion On Board Chemical Tanker. GEORGE TOWN: One crew was killed while five other suffered injuries when fire broke out and caused an explosion on board a chemical vessel, the Heung-A Pioneer, off Tanjung Dawai, here last night. 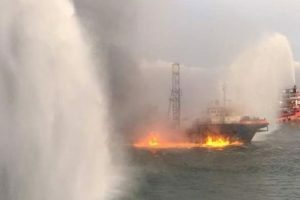 Acting Chief Executive Officer of Penang Port Sdn Bhd (PPSB) Rosihan Adi Baharuddin said a distress call was received from the ship at about 10pm last night claiming an explosion had occurred onboard and that they required medical assistance. He said at the time, the ship was still in Tanjung Dawai, which was two hours away from the Port in Seberang Perai. “As soon as we received the call, we alerted the relevant authorities, namely the Fire and Rescue Department, the Seberang Jaya Hospital, the Butterworth Police Station and the Civil Defence Department (JPAM) to assemble and be on standby to await the arrival of the ship which was still about 45 minutes away,” he said in a statement here today. He said the ship arrived around midnight and the captain of the ship had informed him that the fire had originated from the middle of the ship’s deck. “Upon arrival, the medical officers boarded the ship to check the extent of injuries and confirmed the death of one crew,” he said adding that the five injured crew comprising Korea and Myanmar nationals were sent to hospital for treatment. 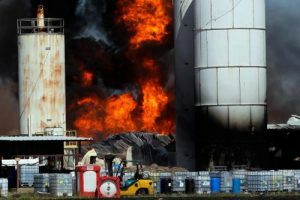 Rosihan said the cause of the fire is being investigated by the authorities and there were no disruptions on the Port’s operations. A check by Bernama revealed that the five injured victims were being treated at the Seberang Jaya Hospital and reported to be in stable condition.